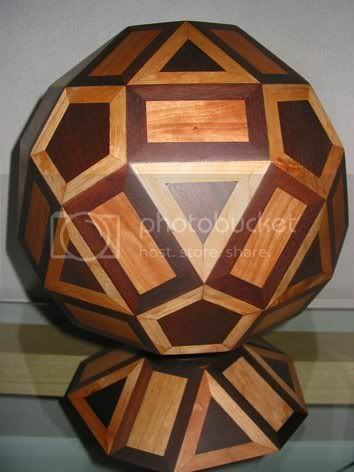 I am fairly new to polyhedra but, quite recently, I have made several models in wood of the various basic shapes. I feel using a section of the model as its base would be quite decorative. 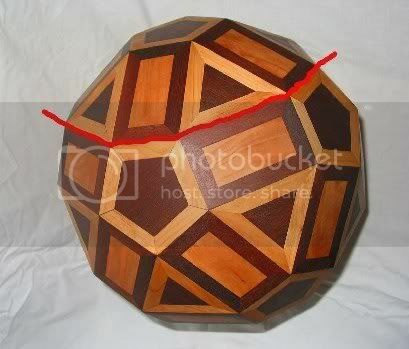 I used faceting mode to create a separate cupola (the cap above the red line), then augmented one of these to another at the top pentagon, then used faceting mode again to create the convex hull of this but with a cupola indented on one side. Starting with the first, I augmented the larger lateral rectangles with prisms, used Ctrl+Left-drag during the augmentation preview to adjust their height (making them shorter), then used faceting mode again to get the new model. Is this horizontal edge what you meant by a skirt? The above indentation would exactly match one of the caps, but maybe you want it smaller or larger than a cap? It is a bit difficult to explain, exactly, in words what I want. My idea is to rotate the model on a copy of a section of the shape. Inside the base I will house a small motor. The 'skirt' (mentioned in my first posting) is to give me a little more space inside the base. I have a sketch, in Autocad, .... How do I insert a drawing into a posting? Just to give you a better idea of what I need! The model photographed, above, is just placed, on the base section, for the purpose of this photograph ..... nothing is fixed at the moment. I need to very tastefully add (about 25mm) to the height of the hollow base to accommodate the microwave turntable slow speed motor. The base 5 rectangles and 5 triangles, (touching the glass table) are already mitred (10.4526 degrees and 15.8587 degrees) .....well as near to these figures as I can set the band saw table. I try to work to the resolution of a digital angle gauge. My gauge has a resolution of 0.1 degrees! These gauges are quite easy to work with and if obtained via e-bay not too expensive. The mitre angle figures were obtained from Stella4D..... and as you can see from the model the figures work wonderfully! This is easily achieved once you've got a model of the cap on it's own in Stella. Just select the large base, use "Poly->Augment Polyhedron" (or hit "a"), choose to augment using a prism. You can either use Ctrl+Left-drag to interactively adjust the augmentation height during the preview, or enter an exact height in the initial form by choosing prism height "Height = 1" and setting the scale to the actual height. If you only want the angles then you probably don't care about the height anyway. I'll email you a .stel file of this model too. Obviously, I can now translate this to my specific needs. This forum is great .... quite a revelation for me personally .... there are actually people out in the big world with similar interests to me. My personal skills are sorting out the 'nuts and bolts' of making these wonderful models from wood with nothing much more than a very average home workshop... so if I can be of any assistance just ask. I understand just enough of the geometry to get the job done ... and that's about all. It is all about helping each other. Where do you show your work? Is it for sale? What kinds of oohs and ahhs have other people responded with? I very rarely show my work. However, only last Saturday, at a local woodworking show I entered four of my constructions. My table looked very 'plain' in contrast to others ... just a wooden table ... no decorations .... no literature ... just the four models. My exhibit won 'Best in Show'. My pleasure really is derived from working out how to do something ... I will spend hours just thinking about methods of construction and making the required jigs. If anyone would like to make me a 'resonable ' offer I would be quite happy to sell one or two of them. Or I would be quite happy to construct any 'shape' to order .... provided I like the shape!